I showed you my Maypop or passionflower vine. 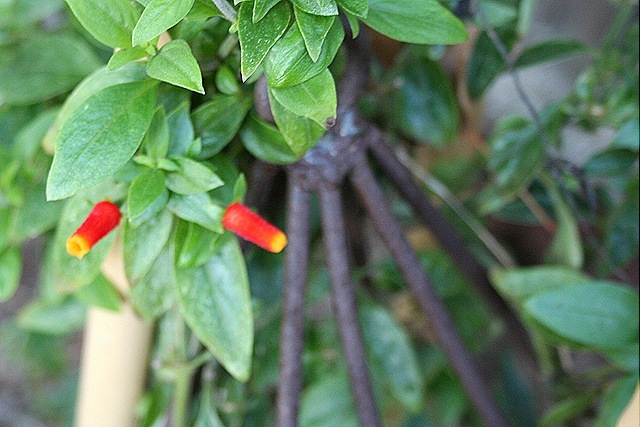 Now I want to share another favorite vine in the garden, the Candy Corn Vine. I don't really like candy corn, but I love this vine and so do the hummingbirds. What a darling vine, I don’t think those grow here in California. I sure do love it! Come by and Visit my blog I am celebrating my 100th Post. It’s a Party and giveaway! I’ve never seen anything like that! How cute! Well I love candy corn! And I’ve never seen this vine before! I’ve never seen that plant! I really hate candy corn, but I love that vine. Very cool.